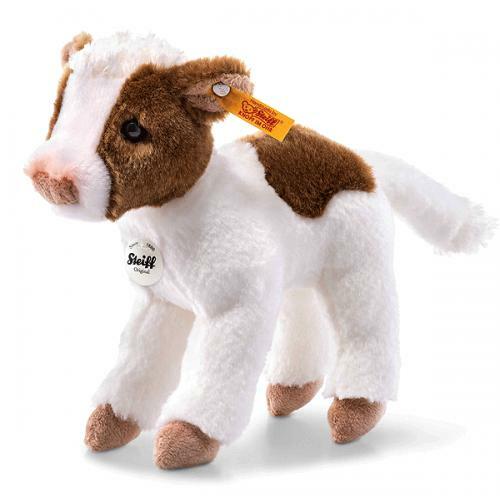 Steiff Lischen Calf is made by hand, in the finest white and brown cuddly soft plush. Lischen calf is 16 cm tall. She is white with brown spots. This young calf can already stand up on all four legs and is sure to begin exploring his surroundings in no time. His hooves, nose and the inner ears are beige. The top of his head features a stylish hairdo, and he has a little tuft of hair just above his nose. Cream-coloured plush fabric was used for this. The pink shading on the nose puts the finishing touch on his cute look. An original gift idea.